Placing a dental implant within the jawbone requires a surgical procedure. For most people it’s a relatively minor affair, but for some with certain health conditions it might be otherwise. Because of their condition they might have an increased risk for a bacterial infection afterward that could interfere with the implant’s integration with the bone and lead to possible failure. To lower this risk, dentists for many years have routinely prescribed an antibiotic for patients considered at high-risk for infection to take before their implant surgery. 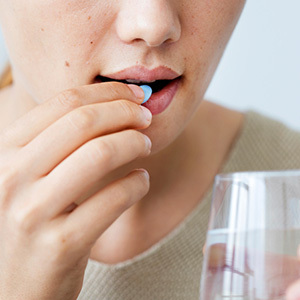 But there’s been a lively debate among health practitioners about the true necessity for this practice and whether it’s worth the possible side effects that can accompany taking antibiotics. While the practice still continues, current guidelines now recommend it for fewer health conditions. The American Dental Association (ADA) together with the American Heart Association (AHA) now recommend antibiotics only for surgical patients who have prosthetic heart valves, a history of infective endocarditis, a heart transplant or certain congenital heart conditions. But patients with prosthetic joint replacements, who were once included in the recommendation for pre-surgical antibiotics, are no longer in that category. Even so, some orthopedic surgeons continue to recommend it for their joint replacement patients out of concern that a post-surgical infection could adversely affect their replaced joints. But while these areas of disagreement about pre-surgical antibiotics still continue, a consensus may be emerging about a possible “sweet spot” in administering the therapy. Evidence from recent studies indicates just a small dose of antibiotics administered an hour before surgery may be sufficient to reduce the risk of infection-related implant failure with only minimal risk of side effects from the drug. Because pre-surgical antibiotic therapy can be a complicated matter, it’s best that you discuss with both the physician caring for your health condition and your dentist about whether you should undergo this option to reduce the infection risk with your own implant surgery. Still, if all the factors surrounding your health indicate it, this antibiotic therapy might help you avoid losing an implant to infection.